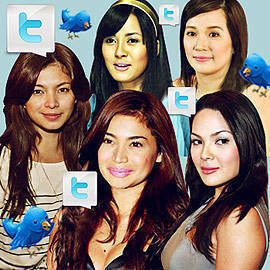 Top 5 Twitter hotshots Anne Curtis, Kris Aquino, Angel Locsin, KC Concepcion, Bianca Gonzalez and 15 more! Check out the Twitter hotshots. Click for more photos. This edition of Tweets of the Week features the 20 biggest local celebs on Twitter as declared by Techie.com.ph. The popular site came up with a list of The 88 most-followed Filipino stars on Twitter who have remained active in the Twitterverse using Twitaholic.com, a site that tracks Twitter users from all over cyberspace. Here, the week’s best Tweets from the Top 20 Celeb Twitterati with the most followers based on the numbers as of posting time. For more on this story, log on to Techie.com.ph and FemaleNetwork.com. Artwork by Warren Espejo. Photos from PEP.ph.